In the year 960 Emperor Romanos II (959-963) appointed Nikephoros Phokas, the future emperor, general of the Roman forces, and he was ordered to lead an army to Crete in a campaign against the Arabs. Before leaving for Crete, Nikephoros was told by his brother Leo that Saint Athanasios was abiding at Mount Athos, so he dispatched a warship for the Holy Mountain bearing letters to the fathers of Athos to beseech the Lord on his behalf that he may achieve victory. He also petitioned that they send his esteemed friend Athanasios with two other virtuous elders to Crete. At first Athanasios did not want to go and leave his life of quietude, but after being urged by the fathers that he must go, he went with two other elders. By the time he arrived in Crete, Nikephoros had seized Crete from the Arabs. When Athanasios arrived in Crete and met Nikephoros, Nikephoros expressed to Athanasios his desire to now become a monk. He offered him money to establish for him and three others a hermitage where he could spend the rest of his life dedicated to God and to the divine struggle for virtue. Athanasios, however, would not take the money, and advised Nikephoros to stay in the world and have the fear of God and attend to his manner of life, and that if in time it was God's will, He would see to it that his desire for the monastic life is fulfilled. This brought Nikephoros much sorrow. Then, after enjoying each other's company for a few days, Nikephoros returned to Constantinople, while Athanasios returned to Athos. The ascetic general Nikephoros then sent Athanasios enough money to establish the Great Lavra Monastery, where Nikephoros was going to live as a monk with Athanasios, but Nikephoros ended up becoming the next emperor and marrying. However, according to the local tradition of the people of the island of Skyros, when Athanasios was on his way to Crete, either a storm at sea took place or Athanasios grew ill, therefore they disembarked at Skyros. 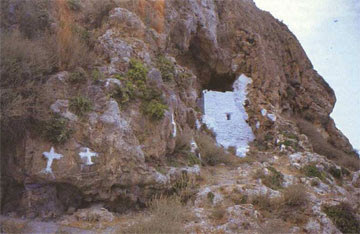 Athanasios ended up staying in Skyros for a year and never arrived at Crete, living in a cave near the Castle. When Nikephoros defeated the Arabs, he stopped at Skyros to meet with his friend Athanasios. This is when Nikephoros expressed his desire for monasticism and to have Athanasios build for him a hermitage. Athanasios obeyed Nikephoros, and built for him the Monastery of Saint George, though Nikephoros did not stay there because he became emperor and married. This is why this monastery is considered a dependency of Great Lavra Monastery in Mount Athos, which was also established by Saint Athanasios, however some scholars believe this dependency took place in the 15th century when it was restored. 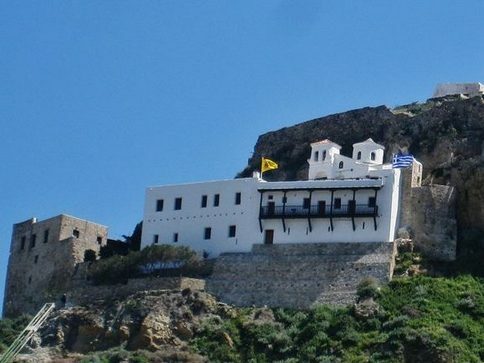 Today the Monastery of Saint George still stands in Skyros as a dependency of Great Lavra, and one can also visit the cave in which Saint Athanasios stayed for a year, in which a new chapel was built in 1602. When you ask the locals about this story, they will say that indeed Saint Athanasios stayed on the island for a year in his cave and established the Monastery of Saint George.